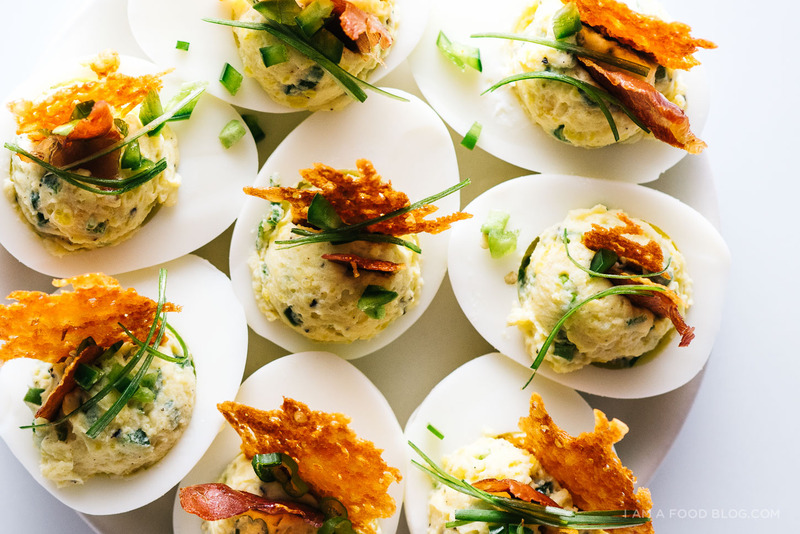 If I see deviled eggs at a party, you betcha I’m going to be there, eating them all up before anyone else has a chance. Okay, kidding, I’d never eat ALL of them. I’d just have an egg or two extra and hope for leftovers. I’m all about the deviled eggs. They’re cool, creamy, and oh so delicious. And they’re perfect for bringing to baby showers! Hmm, wait, now that I think about it, they’re kind of a little morbid to bring to a baby shower…But let’s just ignore that fact and concentrate on Emily and her soon-to-be brand new baby! If you’ve never visited Em’s corner of the internet, head on over and take a peek. You might get a little lost in the deliciousness, but when you’re done, come on back and we’ll talk deviled eggs. I feel like deviled eggs are making a comeback. They’re popping up on menus everywhere with all kinds of crazy mix-ins. It’s no wonder that they’re becoming popular again – they’re handheld and absolutely addictive. Boiled eggs are delicious plain with just a touch of salt and pepper so when you add in other flavours, you’re bound to hit a winner. 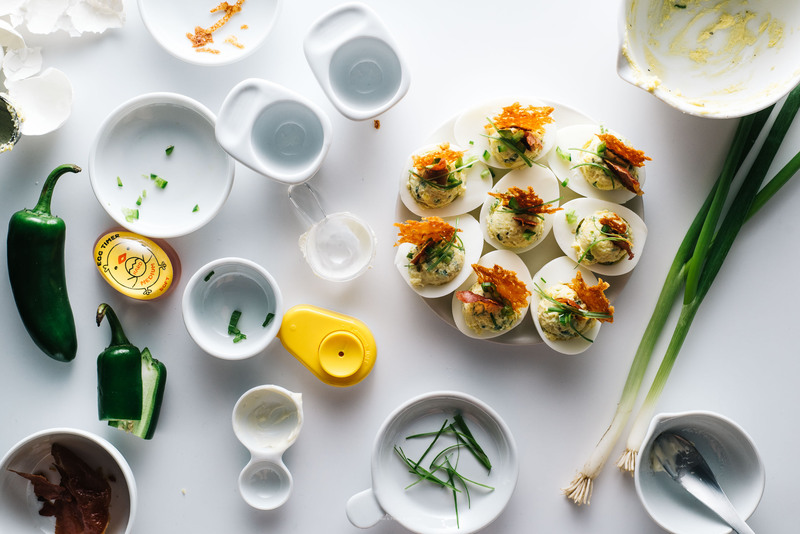 I like a classic deviled egg, but it’s still fun to play around with all the different things you can do. I’m pretty sure anything can be made into a deviled egg. And why not!? Creamy yolks go with anything and everything. Speaking of yolks, I want to try salt curing some. I had some the other day shaved over some rice cakes and they were salty, rich, and almost cheesy. I think they’re definitely next on my to make list. It’s too bad they take 2 weeks to cure. On the other hand, these jalapeño popper deviled eggs are almost instantaneous. A quick hard boil & peel, and you’ve got yolks to mash with mayo, cream cheese, jalapeños, and scallions. Garnish with a crispy frico cheese crisp and some pan-fried pancetta for a bit of extra oomph. These eggs are just a bit fancy because when you’re celebrating a friend about to have their very first baby, you want a bit of fancy! Congrats Emily and Chris – I cannot wait for you guys to meet the newest member of your family! Crisp up the pancetta in a non-stick pan over medium heat until edges curl and pancetta is crispy. Set aside. Wipe out the pan and heat over medium heat. Sprinkle shredded cheddar in tiny disks and cook until crispy and golden brown. Remove from the heat and cool in the pan. 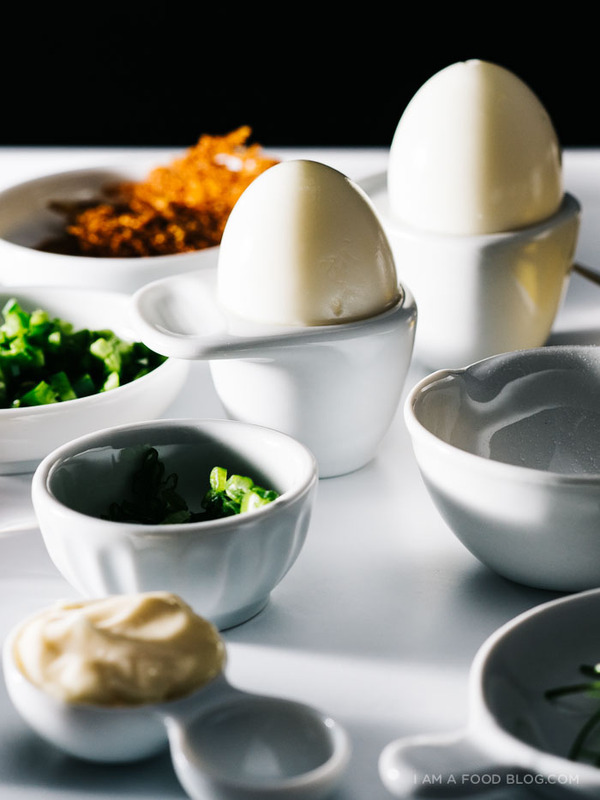 Cut the hard boiled eggs in half and remove the yolks from the egg halves into a small bowl. 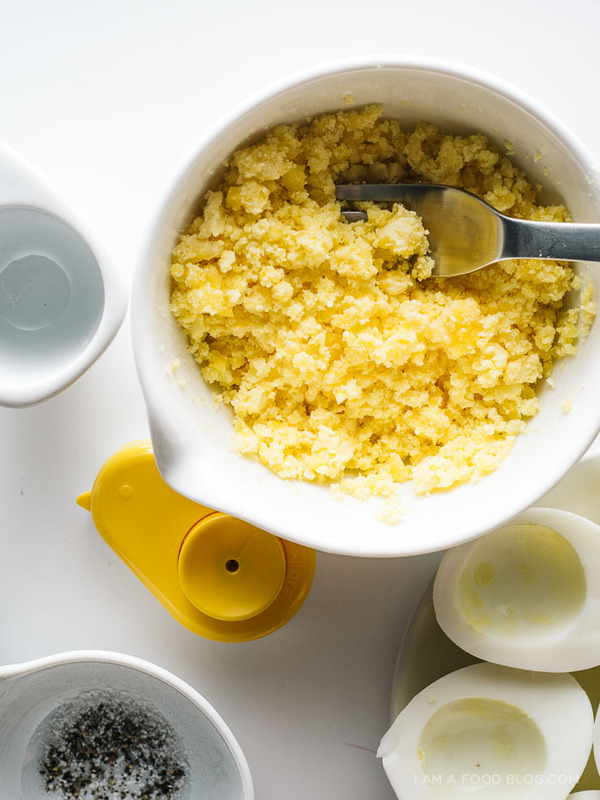 Mash the yolks with a fork until fine and crumbly. Mix with the mayo, cream cheese, jalapeño, green onions and salt and pepper to taste. Fill the egg halves with the yolk mixture and top each egg half with a bit of crispy cheese and pancetta. Here are the other peeps celebrating Em today! Head on over and see what’s cooking! These are just gorgeous! This may be the 2 greatest appetizers coming together – MIND BLOWN. I always go for the deviled eggs at a party, too. I take 2, eat my plate of food and hope there will be some left when I pass by the food table later. Always! I love your recipes! You take amazing pictures that inspire me to cook! I think I will have to try those deviled eggs! How did you develop your voice for blogging? I would love to write as you do on your blog! damn, this is everything. you are a culinary evil genius, you. 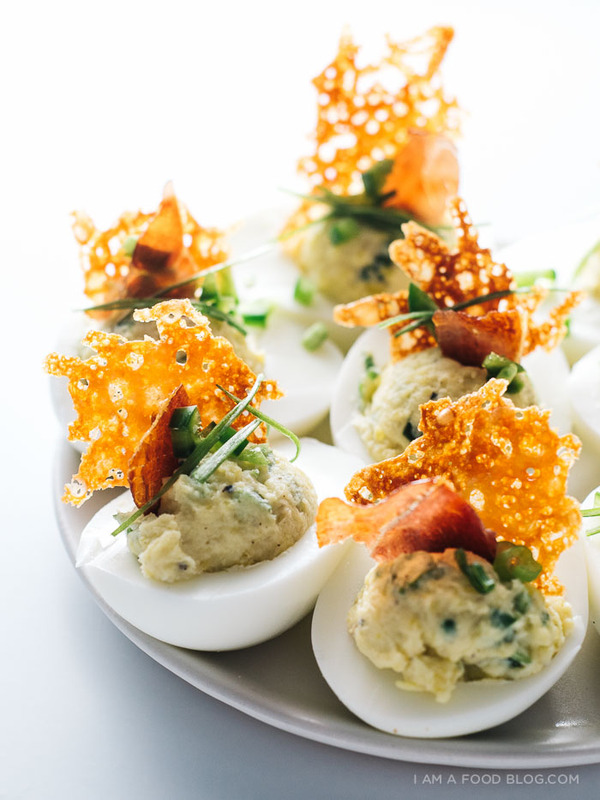 ahh, I am such a sucker for deviled eggs at a party, too! these look delicious! I love the idea of salty cheese crisps, yummm. well this looks freaking divine! this deserves many fancy claps. Oh dear Lord! You are totally speaking my language here…these look amazing! Spicy deviled eggs are my favorite, with sriracha mixed in to the yolk and sprinkled with piment d’espelette. 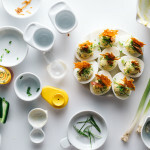 That is until now – no joke, these are the best deviled eggs I’ve ever seen – ever!!! I really love the use of the pancetta. Not only does this dish scream dinner party but it looks and sounds amazing. 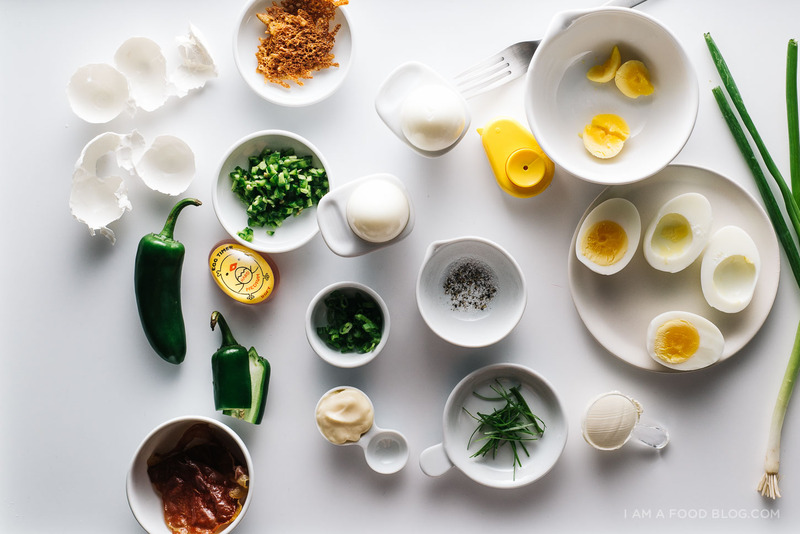 I love cooking with jalapeno’s but never considered using them in deviled eggs. Well done Stephanie! I can’t wait to try this recipe out on my friends! 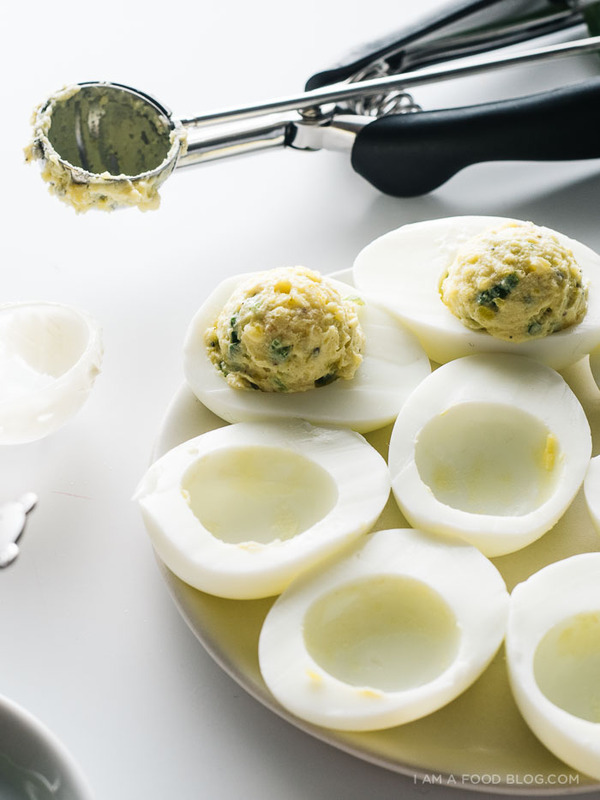 Love your version of deviled eggs! They look so dang delicious. And what is that adorable egg timer??? YES!!! I will have a dozen please!! Whoa!! These sound incredible! So fancy. These are perfect, so right up Em’s alley, obviously. Thanks for celebrating with us today Stephanie, xo! oh yes! 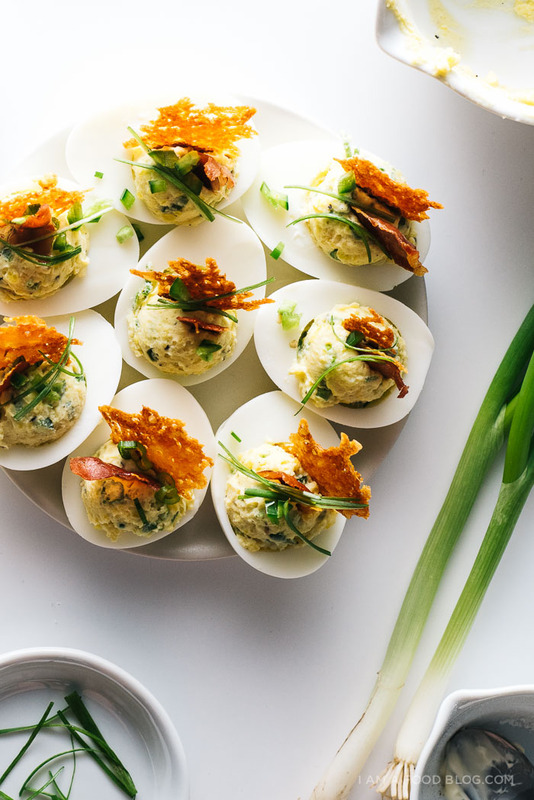 I am all about the deviled eggs and these look BEYOND delicious. I also love how you use a cookie dough scoop to refill the eggs. SO much better than all the tedious piping that normally comes with deviled eggs. These eggs look so delicious, fantastic recipe!!! Ahhhh so excited for emily! Also, the crispy cheese…steph, you = genius. Oh my gosh, these are everything!! The mini frico crisps! Putting jalapeno poppers IN the deviled eggs. THE MINI FRICO CRISPS. I just. I love you. These are glorious, Stephanie!! Insanely good-looking and the flavors – cream cheese, green onion, pancetta, jalapeño and chedder – to die for! You’re a freaking genius. I completely agree with you on the baby shower thing! I’m catering a baby shower next month and I have deviled eggs on the menu. Your version here looks amazing! Love that cheese crisp! Oh HAI. No. 1 Fangirl here to say THANK YOU SO MUCH FOR COMING TO MY PARTY, STEPH! 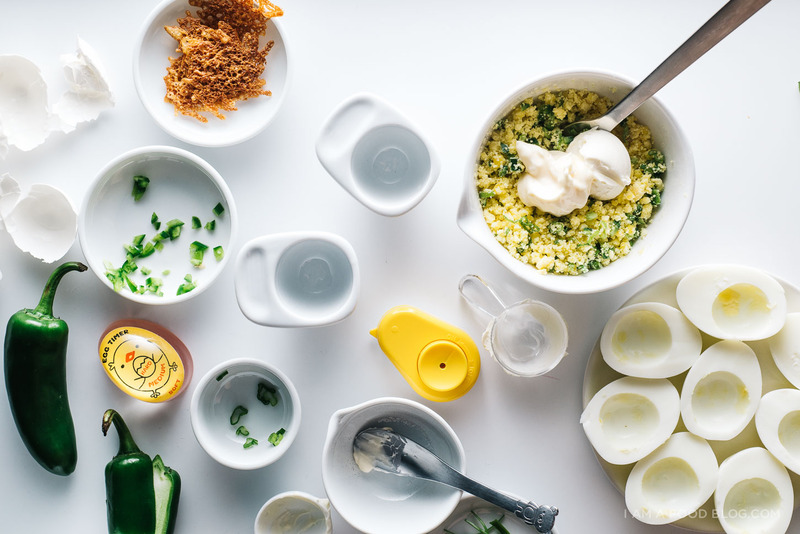 Chris’ two favorite food groups are deviled eggs + jalapenos, so you have hit a tremendous home run with this one. I went so far as to pick up an extra dozen eggs at the store this morning just so I can attempt to approximate the madness. We’ll see how that goes. So glad you were able to join the fun, and big thanks for the sweet words, friend! xoxo! THESE ARE AMAZING!! Moses is obsessed with deviled eggs, yet I never make them for him cause I think they’re kinda boring. These are anything but that. 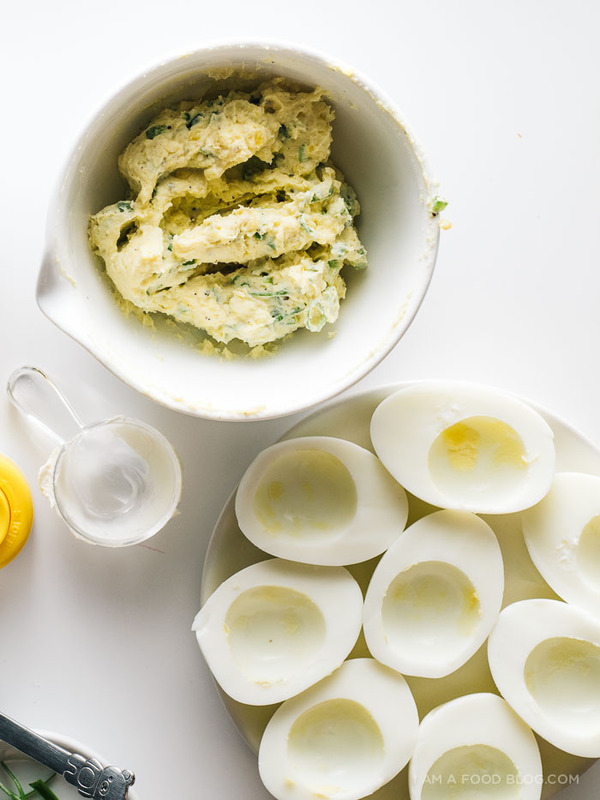 Making these then definitely upping my deviled eggs game after that. You’ve opened my eyes to a whole new world of deviled eggs!! 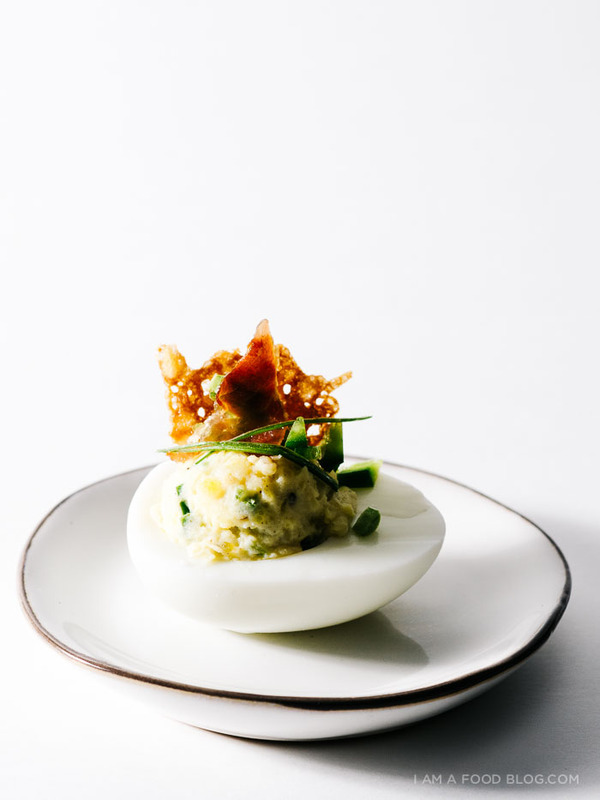 Look at you with the fancy deviled eggs! I agree that they’re making a comeback … They used to seem so ’90s or whatever but now they’re showing up everywhere with fun spins on them like yours. Plus they ARE delicious. Yay for the #emspigletparty! 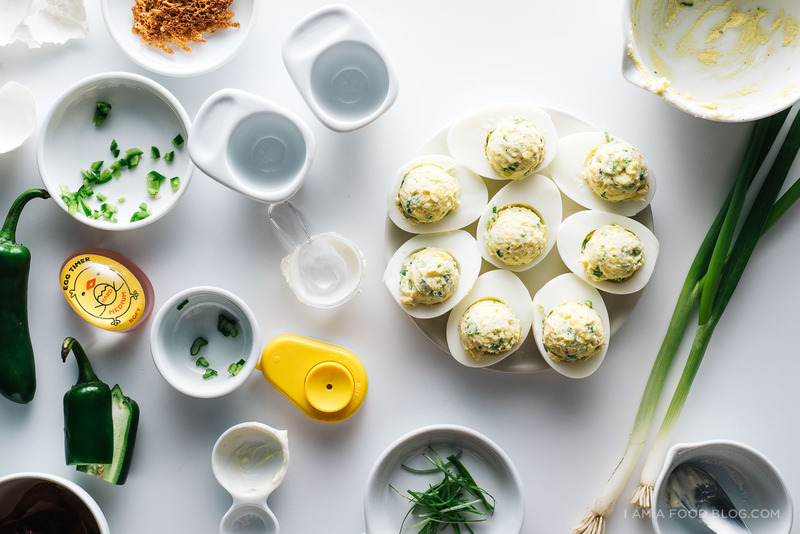 Oh my goodness, this is how I want my deviled eggs from now on. Yes please. I’ll take like 15, please and thank you?